One of the central problems in the modern high energy physics is related to our ability to describe and explain the behavior of the quark-gluon plasma – a state of matter which occurs when gold or lead nuclei collide at very high energies. At temperatures of about trillions of kelvins the quarks, that make up atomic nuclei, deconfine and a “soup” of quarks and gluons is formed instead. This state was also expected in the very early Universe, about 10-11 seconds after the Big Bang or, possibly, in a center of a neutron star. The matter in such a state is interacting strongly so that physicists say that the interaction is characterized by a “strong coupling”. Traditional approaches to the description of quantum fields are limited by the “weak coupling” regime and cannot give reasonable results for quark-gluon plasma. A promising approach is dictated by the famous holography or gauge/gravity duality: a correspondence between the weak gravity on one side and the strong quantum field theory on the other, discovered by Juan Maldacena . On the side of gravity, the black-hole event horizon has Hawking temperature which corresponds to the temperature of plasma on the other side. Immediately after the formation, a black hole is in the excited state; it emits gravitational waves, releases the excess of energy and approaches equilibrium. The characteristic frequencies of such radiation  have been recently observed by LIGO/VIRGO detectors , what confirmed the existence of black holes and gravitational waves. Surprisingly, owing to the holography principle, the same characteristics of black holes play a crucial role in the particle physics: frequencies at which the black hole emits gravitational waves correspond to hydrodynamic characteristics of quark-gluon plasma . Following these ideas, Kovtun, Son, and Starinets predicted a kind of universal behavior of quark-gluon plasmas and any quantum matter in the state of “strong coupling”. 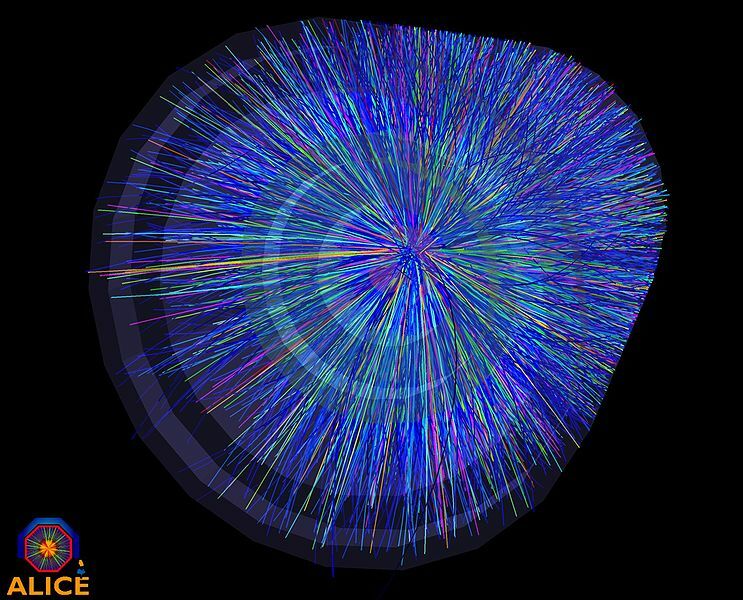 In 2008 observations of quark-gluon plasma during a tiny period of time in the Relativistic Heavy Ion Collider (Brookhaven National Laboratory) confirmed the prediction of this universality . Nevertheless, theoreticians are not fully satisfied with having only an effective description in a specific regime of strong coupling. They want to know the whole way through which the matter evolute to the strong coupling regime. For this to happen, one should understand also the quantum-matter behavior at the intermediate coupling, that is, to construct “a bridge” between the traditional quantum field theory at weak coupling and the holographic strong coupling picture. Recently it has been suggested  that modification of the Einstein theory by adding higher powers of the spacetime curvature in the field equations may represent the desired regime of intermediate coupling. However, we have shown  that the corresponding non-Einsteinian black holes suffer from the catastrophic instability and, moreover, even before the instability occurs, the characteristic spectrum of such black holes has quite a bizarre behavior: there are tones, which have a very long lifetime and almost do not die out. These non-decayed tones of the black-hole spectrum would mean on the other side of the holography that the quantum matter, once it is perturbed, never, or after a very long time, relaxes to the state of equilibrium. This makes the considered modified black holes bad candidates for the desired “bridge” between the weak and strong couplings. J. M. Maldacena, “The Large N limit of superconformal field theories and supergravity,” Int. J. Theor. Phys. 38, 1113 (1999) [Adv. Theor. Math. Phys. 2, 231 (1998)] [arXiv:hep-th/9711200]. R. A. Konoplya and A. Zhidenko, “Quasinormal modes of black holes: From astrophysics to string theory,” Rev. Mod. Phys. 83, 793 (2011) [arXiv:1102.4014 [gr-qc]]. B. P. Abbott et al. [LIGO Scientific and Virgo Collaborations], “Observation of Gravitational Waves from a Binary Black Hole Merger,” Phys. Rev. Lett. 116, no. 6, 061102 (2016) [arXiv:1602.03837 [gr-qc]]. P. Kovtun, D. T. Son, and A. O. Starinets, “Viscosity in strongly interacting quantum field theories from black hole physics,” Phys. Rev. Lett. 94, 111601 (2005) [arXiv:hep-th/0405231]. M. Luzum and P. Romatschke, “Conformal Relativistic Viscous Hydrodynamics: Applications to RHIC results at s(NN)**(1/2) = 200-GeV,” Phys. Rev. C 78, 034915 (2008) Erratum: [Phys. Rev. C 79, 039903 (2009)] [arXiv:0804.4015 [nucl- th]]. S. Grozdanov, N. Kaplis, and A. O. Starinets, “From strong to weak coupling in holographic models of thermalization,” JHEP 1607, 151 (2016) [arXiv:1605.02173 [hep-th]]. R. A. Konoplya and A. Zhidenko, “Quasinormal modes of Gauss-Bonnet-AdS black holes: towards holographic description of finite coupling,” JHEP 1709, 139 (2017) [arXiv:1705.07732 [hep-th]]. This study, Quasinormal modes of Gauss-Bonnet-AdS black holes: towards holographic description of finite coupling was recently published by Roman Konoplya and Alexander Zhidenko in the Journal of High Energy Physics. Roman Konoplya is a researcher at University of Tübingen Institute for Theoretical Physics. His research focuses on high energy physics, general relativity, and theories of quantum gravity. Alexander Zhidenko currently works at the Center of Mathematics, Computation and Cognition (CMCC), Universidade Federal do ABC (UFABC). Alexander studies linear perturbations of black holes and associated problems.